Air quality today is the worst ever so far in 2014. Indicator is in the upper end of the unhealthy range. The haze from the burning of vegetation to grow palm oil trees in Indonesia is back. Hidden price of cheap via the burning method. Will the haze get even worse in the days ahead? I had difficulty breathing in June last year when i woke up. Comparison pictures can be seen in blogpost: Worst Haze, Decline of Condensed Milk & Emergence of Creamer. China, which is regarded as the world's factory is notorious for its air pollution. People around the world are thrilled by low prices of items made in China. Many don't think about the hidden price that the chinese pay with their lives. As i've blogged in Repairing Backrest of Chair & Punctured Bicycle Tubes, it is not just about saving $$$ but also on reducing waste. The watch's strap has been broken for a while. It didn't cause much inconvenience as i can rely on my mobile phone for time. My mindset is to avoid doing repair work in shops in SG due to to the killer rental. My 1st choice is to turn to eBay to buy the replacement strap but i didn't buy any. I did have a rough idea of the price for the replacement strap though. Later i went over to Johor Bahru to replace my badminton string as well. My racquet string has been broken for a while too & i borrowed other people's racquet to play in the meantime. Such are the inconveniences i lived with till i made the trip across the border to do repairs. In overconsumption Sillypore, some badminton players have 3+ racquets. Yet amid the overconsumption mania, the country is the world's most unhappiest in Gallup's 2012 survey. Pathetic? Did my watch strap replacement here in JB. RM8! I was astonished that it's cheaper than eBay. Boss finished the job in less than 2mins. Such mom & pop watch shops are close to extinct in SG. In its place are those spam chains in shopping malls. Is good knowing money is spent on a deserving person like the watch shop boss. Why benefit the greedy landlords in SG? I have thought of buying a new waist pouch which i mostly use for my cycling trips when its buckle broke. Looked at a few models at online stores but didn't buy any mainly due to poor description of dimensions. Not too big, not too small for the size due to cycling needs - spare tube, hand pump, bandage(touch wood), tools, tire levers, tissue, comb, phone & some spare capacity. You can see below that i've put a pen there to let you gauge the size. Buckle(left) only has center portion. Upper portion broke still can use. Lower portion broke - is either buy new bag or think creatively to fix. Long white border rectangle is velcro being sewed on by my mum using the sewing machine. Bought the velcro strip at $2 Daiso shop(SG). A curse that the hybrid regime has fallen into is lack of creativity after sucking so much $$$ via indirect taxes from the populace. I'm sure you know of prisoners who managed to create weapons out of seemingly ordinary objects. Such is creativity due to scarcity. In Vietnam War, creativity by poor peasants can be seen via their booby traps made from wooden sticks & branches. Easy thing for me is to buy a new bag. The harder thing is to think of how to fix it in an economical way. RM6.90 for light. Roughly same specs sell for at least double in SG. Super glue for more repairs. 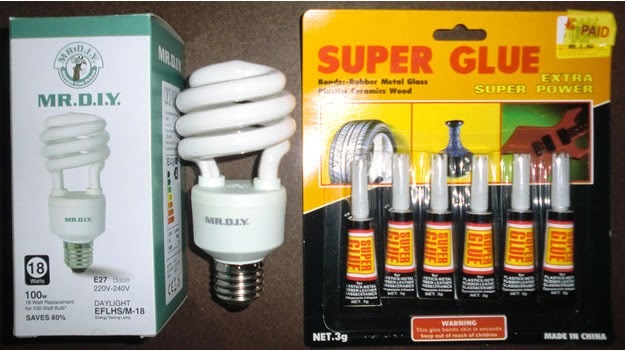 Made a trip to hardware store 'Mr DIY' - a malaysian SME to buy a spare light & super glue. No need plastic bag as i requested so the cashier pasted the 'PAID" sticker. Items put into my sling bag. Less consumer demand = Less pressure to burn & create haze.